Thomas Langhans flew from San Francisco International Airport to Chicago in 1981 to pick up his own private star observatory. He carted it home to San Bruno in an 18-foot rental truck and since then it has sat, like a grey 12-foot tall mushroom, between his garden shed and the neighbor's fence. And on clear nights the retired United Airlines mechanic creeps into his backyard and aims the 16-inch Meade LX-200 ACF telescope up at the heavens. 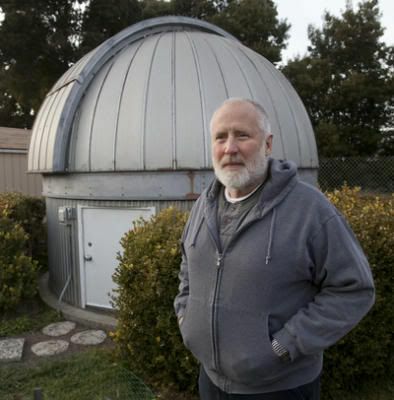 Langhans is one of thousands of Bay Area amateur astronomers -- scores of whom have their own backyard observatories -- and who spend their free time scanning the night skies. From Berkeley to San Jose and San Mateo to Livermore they are watching while most of us sleep. For them, perfection is not the San Francisco 49ers or Facebook, but all that glows in the sky really, really, really far away. Langhans, 65, likened his star-gazing to spotting a celebrity walking down the street. While everyone has seen the planet Saturn and its rings in photos, illustrations or on TV, to see it blaze in real life is likely to produce a jolt of adrenaline. Or at least it does for him. In fact, spotting Saturn was how Langhans' obsession began roughly 38 years ago. He'd been intrigued by astronomy since seeing a telescope sitting in his neighbor's front window while still a high school student in his hometown of Langhorne, Penn. But he didn't buy his own until he was living in Michigan in 1973. He set it up in a freshly plowed cornfield next to his apartment. Then he caught his first glimpse of the second largest planet in our solar system. "I kind of got excited," he said. "I dragged my wife outside so she could look at it." Cheryl Langhans doesn't share her husband's need to spend as many as 12 hours at a crack staring at the sky. But she said she doesn't find it ridiculous either. She's proud of his self-taught skill and likes the pictures he takes of the heavens. Even the observatory dome in the backyard is no big deal. "I was all for it. I knew when I married him that he was interested in astronomy," she said. "I knew he was going to need one." Thomas Langhans has plenty of company. The manager of optic supply store Scope City in San Francisco, Sam Sweiss, said the store sells as many as 30 backyard domes a year. Sweiss said the Bay Area is absolutely crawling with part-time sky gazers. "We have at least 5,000 astronomers in the Bay Area who belong to groups," he said, adding that they are typically older than 50, are educated and have some means. They also tend to be handy. "They build their own domes with a sliding roof," he said. Langhans' fixation has been nurtured mostly in solitude. 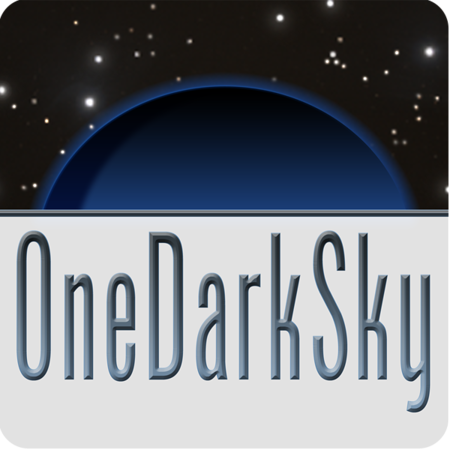 He has no formal training in astronomy and has gained much of his knowledge through such stargazing enthusiast's magazines as Astronomy or Sky & Telescope. An ad in the back of the former publication led him to the supplier of his observatory. "There's got to be a half dozen astronomy clubs around here," he said. "I'm not the clubby, partying type of person." For Langhans, looking at the stars is also a way to retrace the steps of some of the most brilliant people to walk the Earth in the past couple centuries. When Langhans stares at the Milky Way he is seeing what Galileo or Copernicus saw. He says he doesn't have the concentration or smarts to keep up with such lofty company. But he related these points as he demonstrated how he installed, nearly by himself, the technical guts of the observatory. "I can do this at my own pace," he said with a shrug. Though he said he has never seen any UFOs or other strange things zip through the sky, his studies have left him sure of one thing: We are not alone in the universe. It's a simple matter of probability, he says, considering the number of galaxies, planets and stars. "There are billions of them out there," he said. Sounds a lot like myself, less the backyard observatory and younger, of course. If only I had one of those domes!